Ok, so every time you've written music and lyrics to this day, there have been two sides of you involved in the process. These two sides are self one and self two. By now you are realizing that you will be able to create your best music when you allow self two to "take over", and not allow self one to get involved. When you do this you will be able to get into the "flow state" where you are most receptive to your richer creative resources, and your song writing abilities will develop at a staggering rate because of this shift. The next question is fairly obvious. How Can You Write Exclusively With This "Inner Songwriting Master"? How can you write music exclusively with self two, and completely ignore self one? You'll be pleasantly surprised when you learn the simple nature of the answer. To explain it, I first want to discuss the topic of attention. You, me… humans in general have an excellent ability to direct our attention. For example, if I asked you to pick an object in the room, and focus your attention on it, would that be hard? Go on, try that now. Choose something in the room and look at it. Focus your attention on it. Study it until you notice the finer details. Now, take your attention off this object, and instead make a picture of an apple in your mind, and focus on that. Isn't it fairly easy to see the picture of an apple inside your mind? Now instead of focusing on the picture of the apple inside your mind, focus your attention on the sounds around you. Can you hear any noises? Is there are car engine revving in the distance? Can you hear the sound of your computer quietly humming away? What else can you hear? What you've just proven in this simple exercise is that you have the ability to direct your attention. This brings us to the answer of the question at hand. Here’s the question again: How can you allow self two to "take over" your song writing, and completely ignore self one? Direct your attention away from self one. ..."Loosen your hand on the fretboard"
..."You could use an A minor scale in this part"
Once again though, this does nothing but interfere with the natural, gifted songwriter that exists in the form of self two. Now it can be hard to simply "stop" self one from "speaking up". It's sort of like trying to fall to sleep at night. You can't force it. When you try to fall asleep you will actually keep yourself awake. It's only when you take your attention off trying to fall asleep that it will actually happen. In a future part in this series you will learn some highly effective techniques that will allow you to easily direct your focus away from self one, allowing your song writing master, self two to flourish. There’s a few more important things I need to share with you. 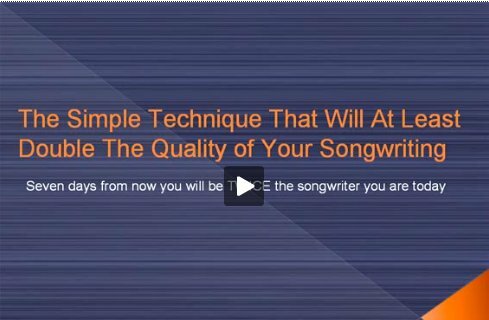 For example, in the next part, I will take you through Free Playing, which is an exciting technique that will help you to generate song idea after idea, greatly accelerating your song writing abilities in a very short time.